Gateway Safety, an award-winning manufacturer of safety equipment, introduces Temple Technology® safety eyewear, a collection of safety products engineered to fit users much more comfortably. 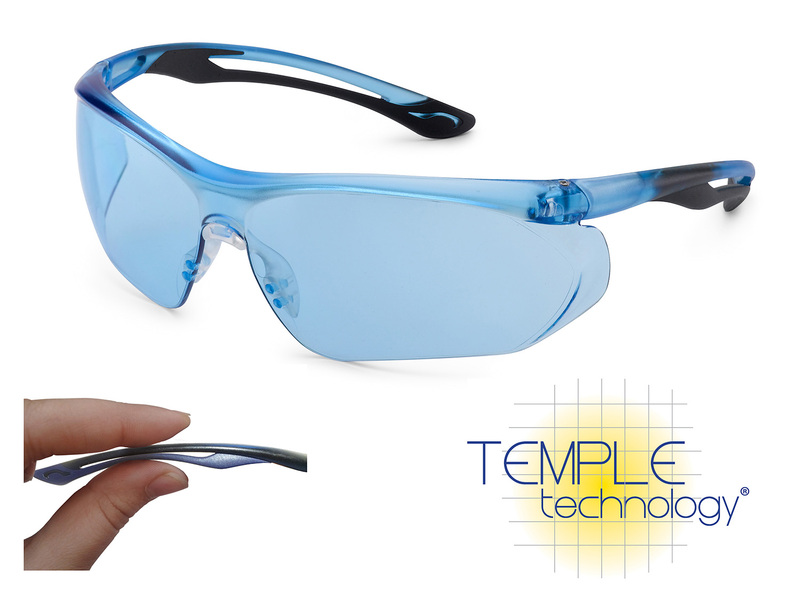 Temple Technology products feature unique temple qualities that eliminate pinching while fitting securely - ultimately creating eye protection that workers will truly enjoy wearing. The Temple Technology umbrella includes three distinct safety eyewear products: Luminary®, Flight® and Parallax® safety glasses. Each product has a unique temple feature that relieves pinching and pressure on the head and ears. The most recent product to hit the market, Parallax safety eyewear, features a patented, dual-component temple design that helps the temple softly flex against the ear and head. A one-piece polycarbonate lens and top brow guard help provide wraparound coverage, and a soft nosepiece helps keep the glasses from slipping. Weighing just four-fifths of an ounce, Gateway Safety’s Luminary safety eyewear is one of the most lightweight safety glasses on the market. Plus its ultra-flexible temples self-adjust to accommodate nearly any size head, relieving pressure behind the ears. A rubberized coating on the temples as well as a “fingertip” nosepiece prevent slipping to help ensure a snug fit. 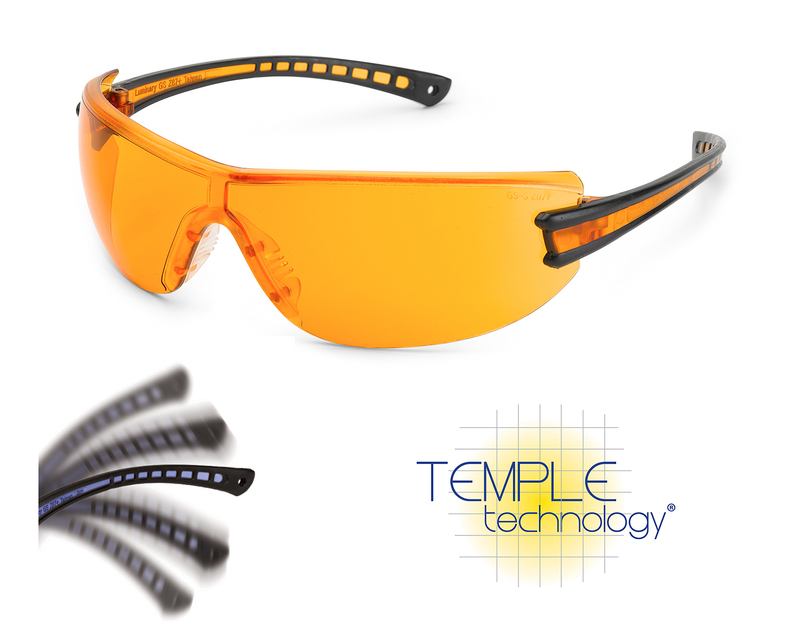 The Temple Technology eyewear line also includes Flight safety eyewear, which includes a revolutionary design with unique, patented temple “wings” to cushion the head and relieve pressure. In addition to its engineered comfort, Flight has a unique floating lens design that allows air to flow between the frame and the lens, helping to fight lens fogging. All three products in the Temple Technology family provide serious protection. They are certified by Underwriters Laboratories to meet ANSI Z87.1+ and CSA Z94.3. These safety glasses also meet the ballistic impact resistance requirements for eyewear as per U.S. military performance specification MIL PRF-31013, and provide 99.9% protection against UV-A, B & C light. Gateway Safety is one of the most established and successful manufacturers of personal protective equipment, creating award-winning, cost-effective safety products in eye, face, head, hearing, and respiratory protection. Gateway Safety works hard to produce safety products that workers want to wear—helping companies increase safety compliance, improve the overall welfare of their employees, and reduce the high costs associated with workplace injuries. With many products independently certified to meet ANSI and CSA standards, Gateway Safety ensures its products are safe, durable, and of the highest quality. For more information, visit http://www.GatewaySafety.com or email marketing(at)gatewaysafety(dot)com.